This week we had a unique baby shower cake. The theme for the baby shower cake was Dragon Princess based on the famous TV show "Game of Thrones". The mom to be wanted a beautiful pillow cake with the princess crown on top! The cake also featured two gumpaste kitties which were made the same color as their actual cats. Definitely a fun cake to make! 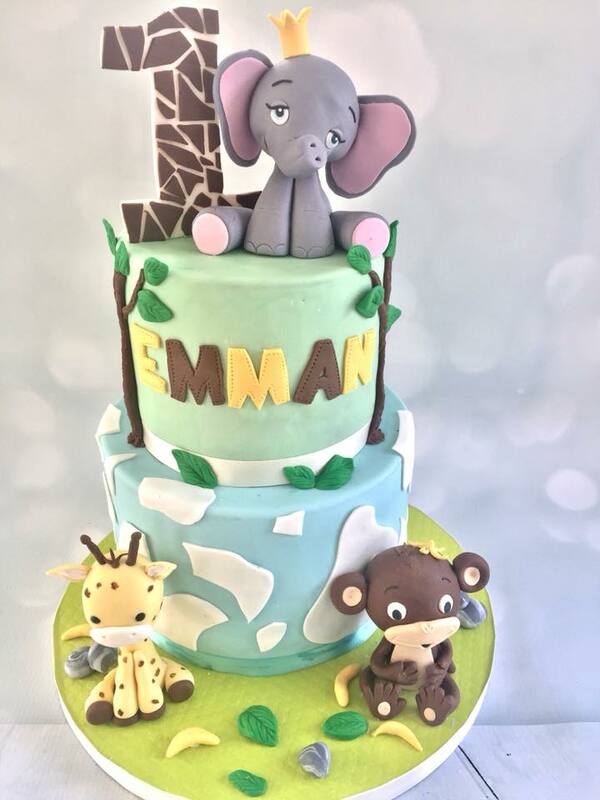 This weeks high lighted cake is this adorable safari themed 1st Birthday cake! I totally loved making these cute as a button gumpaste baby animals! Needless to say our client was more then pleased with the outcome! Check out her review here. Today's cake was a stunning and simple double barrel black and white striped cake. The cake was topped off with a large pink peony and green sugar leaves. This cake was made for one of our favorite repeat clients from Fort Lee, NJ. This week we had the pleasure to create a beautiful Baptism cake for baby Liliana Ivory! The cake featured a large tiger lily sugar flower, a sleeping baby, a cascading pink ombre, a gold rosary and beautiful blue butterflies. Our favorite beauty from this past weekend was a stunning Bridal Shower Cake which was delivered to a beautiful bride in Riverdale, NJ. The theme for the shower was "Showers of Happiness". The cake featured a life size, edible high heel shoe and purse! The bride was extremely happy and left us a wonderful review. Thank you Adriana, we wish you a happy and long loving marriage in your future! This past weekend we made this superhero themed cake for a special young boy who is turning 4! He is absolutely in love with superheroes so we decided to make a model of him and place it on the top tier to make him the ultimate super hero himself! He is super Gennaro! Hope he had the best 4th Birthday!! Here at Sweet Cake Fetish, want to tell you that not all fondants are created equal. We do not purchase processed fondant that we scoop out of containers. Our delicious fondant is homemade. We use just THREE quality ingredients and make a fresh batch for each cake. Our marshmallow fondant is made out of yummy marshmallows, sugar and vanilla! That's it!! We also roll our fondant as thin as possible, about 1/8 of an inch thick! So don't fear fondant, especially not ours! Our cakes taste just as good as they look! This week we created these adorable and delicious Christening Cake Pops for a special client of ours! The cake pops are french vanilla cake with cream cheese frosting and dipped in white chocolate. They featured a small chocolate pink cross and pink candy sprinkles. Our client was very pleased and send us this message. One of our absolute favorite things to do is Sugar flowers. We always aim for the most realistic look and details. We some times even add scent to the sugar roses to give you the best experience. Sugar flowers are almost always made from Gumpaste. Gumpaste is an edible medium that dries very hard which helps the flowers hold their shape and secure firmly to cake. Gumpaste, although edible, is not very tasty and most likely never eaten. The good thing about these flowers and any figurines made with gumpaste is they can be kept forever! This is especially great because you can keep your flowers as keep sake reminder from your special event! There is no limit for us when it comes to recreating beautiful sugar flowers! The sky is the limit! Check out some of our beautiful flowers that adorn our cakes here!